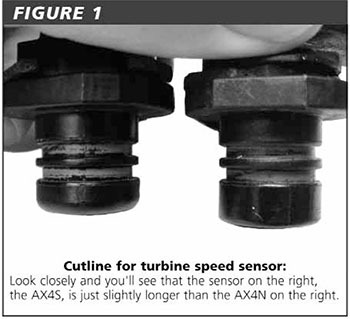 At first glance you might think the AX4S and AX4N turbine speed sensors are the same. However, a closer look will show you that the AX4S sensor is a little longer – which means the wrong sensor could easily be installed in the wrong unit by mistake. 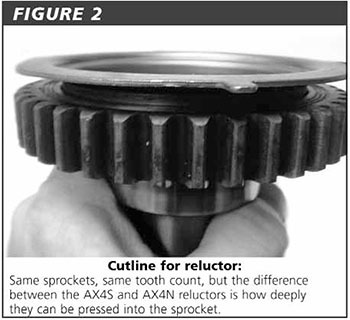 You can also look at the driven sprockets from an AX4S or AX4N, and not notice the subtle difference in the reluctor depth. The driven sprockets themselves are the same and the reluctors have the same tooth count. However, the reluctor is pressed into the driven sprocket at a different depth, so they, too, could be installed in the wrong unit by mistake. AX4S turbine speed sensor with AX4N sprocket: With this combination, the reluctor will make contact with the sensor and damage it. AX4N turbine speed sensor with AX4S sprocket: With this combination, the air gap between the sensor and the reluctor will be too great, and could cause ratio codes and/or a turbine speed sensor code. If you’re not sure if you have an AX4S or AX4N driven sprocket, measure the air gap before you assemble the unit. The correct air gap between the turbine speed sensor and the reluctor is approximately .120 inches. If you think you might have the wrong combination of parts and the unit is already assembled, check by measuring the depth of the turbine speed sensor hole to the reluctor. If your measurement is .687 to .709 inches, you need the AX4N sensor F5DZ-7M101-A. 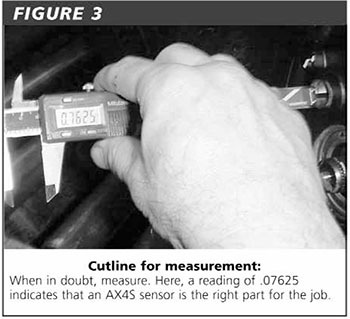 If your measurement is .759 to .772 inches, you need the AX4S sensor F1DZ-7M101-A. Special thanks to Gary Carlson of Certified Transmission for his help in gathering information for this article.